With the hectic lives we lead today, getting a restful sleep each night is more important than ever. Failure to get enough sleep can lead to a weakened immune system, improperly regulated metabolism and a drop in mood. That’s not to mention the significant reduction in overall performance you’ll experience leading to struggling through the day rather than embracing it. While the optimum 8 hours a night might not be achievable – or, indeed, necessary – for everyone, it’s paramount that you get the amount of sleep your body cries out for. With today’s white noise machine reviews, we’ll explore 5 of the very best sound generators on the market, all of which come in at a very reasonable price point. Once we’ve looked into this quintet of sleep aids so you can compare the various features set against your specific needs, we’ll look into why you should get a white noise machine in the first place. Although these machines serve up a variety of sounds, for the sake of clarity we’ll use the term white noise machine throughout to refer to all sound machines of this order. 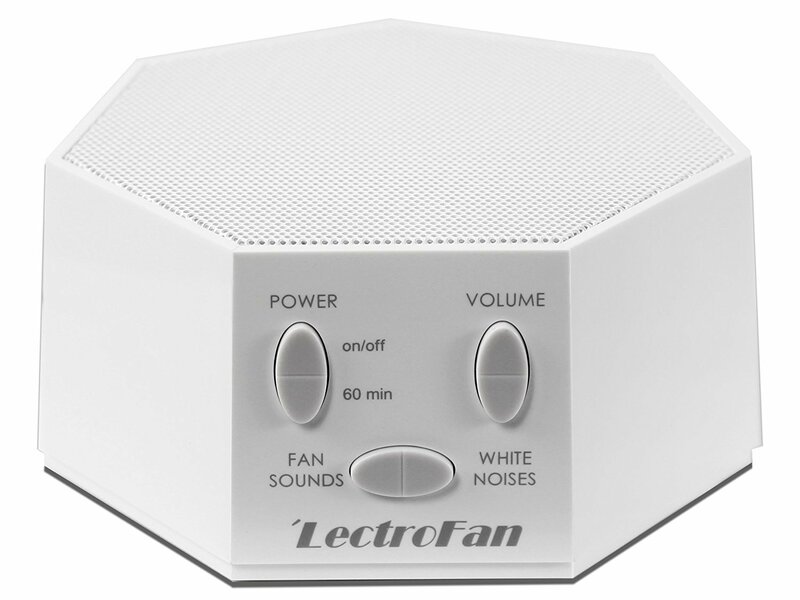 To kick off our white noise machine reviews, we’ve got the LectroFan from Adaptive Technologies. With thousands of extremely satisfied customers worldwide, it’s tough to find much bad press about this superb speaker. Available in a black or white hexagonal design that managed to look both solid and streamlined at the same time, this white noise machine will sit comfortably on any bedside dresser without dominating it. It measures up at just over 4 x 4 x 2 inches so it’s a compact piece of kit weighing a fraction over a pound. While it’s not designated as a travel machine, it certainly fits the bill if you want some peace and quiet when you’re on the road. While it’s a pocket-sized machine, don’t think for a minute you’ll get a flimsy piece of kit. Build quality is top-notch and it feels amazingly substantial for a tiny device. The selection here, since it’s not muddied by any nature sounds, is more than wide enough for most tastes. The ambient noises run from a very low-pitched batch of brown noises up through mid-range pink noises, topping out with some far higher-pitched white noise at the upper end. Many of these machines offer only a slim choice of sounds meaning if you find it grates, you’re clean out of luck. Replacing the idea of a physical fan, there are also 10 electronic fan noises to navigate if the colored noise is not to your liking. These replicate the sound kicked out by ceiling fans, box fans or circular fans but without the iced factor. Another key advantage of the LectroFan is that the sounds are not recorded but dynamically generated. This sidesteps the repetitive nature that can blight lengthy recordings. The solid-state set-up means there are no moving parts to let you down. Surprisingly given its diminutive stature, the volume packs a considerable punch at full clip. 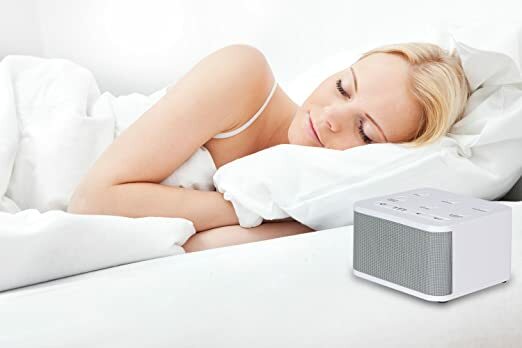 Powered by either AC supply or USB, you can enjoy complete versatility with this white noise machine whether at home or traveling. A number of happy users have fed back success stories of cajoling their babies sleep-wards with the LectroFan. Since the volume is so easy to manipulate and the 60-minute timer shuts things down without exposing their young ears to extended periods of sound, this unit works admirably if you want some assistance with a baby reluctant to edge toward a contented sleep. As well as functioning as an effective sleep aid, you can also press the LectroFan into commission if you want an added boost of focus when you’re working or studying at home. If you work from home, perhaps you find the daytime environment a little too disturbing for proper concentration. Give the white noise or fans a blast and you might just find yourself lasering in more efficiently on the task at hand rather than being distracted by the neighborhood dogs or children. There are no serious downsides to this white noise machine merely a couple of minor niggles. While not expensive, it’s among the pricier of these units so if you’re motivated purely by the bottom line, one of the other models we review would be a better bet. Equally, if you want the sounds of wildlife and nature to edge you into the land of nod, look elsewhere. The only other limitation is that the timer has a single 1-hour setting so it’s not as adaptable as some competing machines. Getting the right white noise machine is not an exact science, it’s simply a question of angling toward one with the right sounds and functionality for your specific circumstances. To that end, if you’re hoping for the gentle splashing of raindrops or the chirruping of birds, you should check out one of the other machines we review. If, on the other hand, you want a rock-solid little unit with a nice range of white and colored noise variants you can ramp up to a highly respectable volume, check out the LectroFan at your earliest convenience. 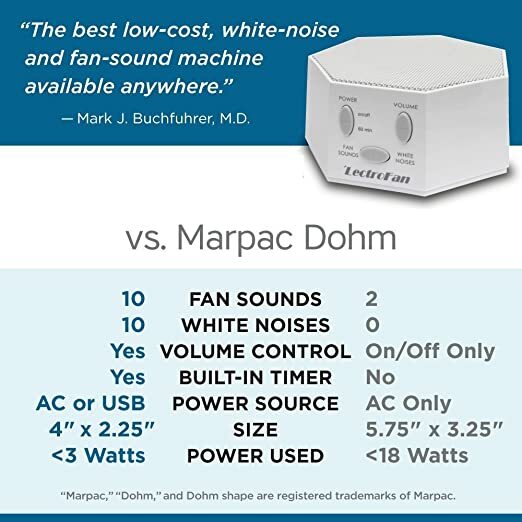 Few lists of the best white noise machines fail to include the Marpac Dohm, a device with a loyal following spanning over half a century. There’s always a reason why classic products endure and we’ll outline today just where this nifty white noise machine hits home run after home run. The company’s strapline is that this machine gives you “everything you need” but “nothing you don’t.” This sums up the pared-down simplicity of the DS perfectly. Color-wise, you can opt for black, white, or tan. The unit is slightly larger than the LectroFan from Adaptive Technologies but still reassuringly small. It’s a machine designated expressly for home use running on 120 volts but, given its compact nature, if you’re going on a road trip it’s not going to take up much space in your luggage. When it comes to sounds, the DS is more restrictive than many white noise machines so you need to be absolutely clear on what you want from your sound-masking equipment. We outline more fully below in our buying guide the various types of machine available. In essence, all you get is fan sounds with the Marpac Dohm. If you fancy a spot of birdsong or some undulating waves then this is guaranteed to disappoint. If, though, you enjoy the comforting sound of a fan but you don’t want the burst of cool air, the DS delivers fully. Although you get nothing but the white noise replicating the sound of a fan, you can make small adjustments with ease. The volume setting is limited to high and low only and altered using the DS’s single button. If you want to step up and down through the offered frequencies, all you need to do is twist the machine and you can settle on the frequency that makes the best fit for your particular requirements. One of the major snags with many white noise machines is the sorely repetitive nature of their pre-recorded sounds. If you’ve ever tried to listen to one of the 10 hour sleep videos on YouTube, you’ll appreciate that constantly looped noises can wear very thin very quickly. The asymmetric fan kicks out fresh white noise that will distract you from the underlying disturbance of a noisy environment without driving you insane. 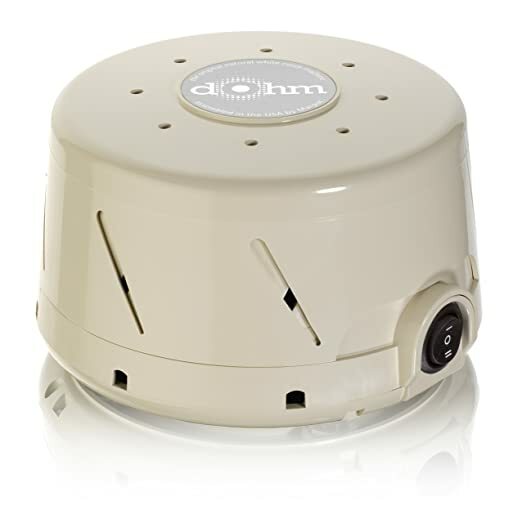 You can opt to buy the DS along with an accompanying travel white noise machine, the Marpac Rohm. While this might seem tempting, we’d mention a couple of things that might put you off… Firstly, the DS is so portable anyway that unless you strictly need the USB capability or a second unit, it’s hardly worthwhile. Beyond this, there’s no discount offered if you buy both machines together which is frankly disappointing for any bundle of products. There are a few drawbacks with the Marpac Dohm that we outline below in our pros and cons section. We never hide the downsides of a product as we want you to go into any prospective purchase fully armed with the facts. Most notable of these minor bugbears is the very slim band of volume. The DS is rated at 61 decibels on low and only 69 on high. 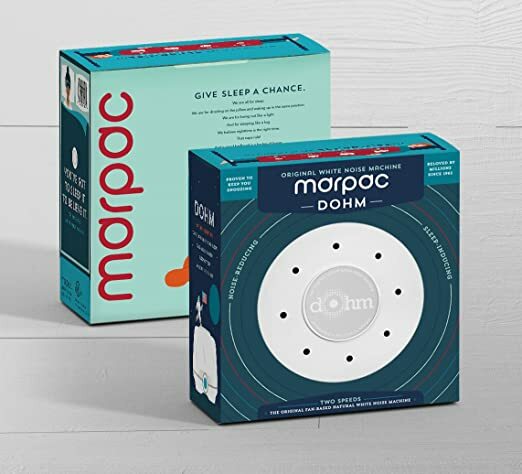 Anyone on the trail of a feature-rich white noise machine packed with an array of choice will be disappointed with the Marpac Dohm so we’d strongly suggest you look at alternatives. 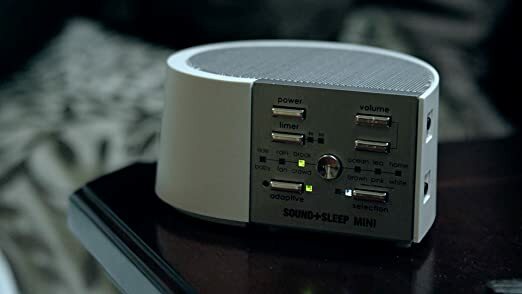 On the other hand, anyone with a distaste for technology and a strong desire for a fan experience in one tiny package should find their sleep patterns improved with this crude but effective white noise machine. While it’s not as cheap as some models, it still represents great value. There’s not too much of a discrepancy between high-end and budget models when it comes to white noise machines. Unless cash really is too tight to mention, the DS should be affordable if you think this machine meshes with your needs. As we hit the midpoint of our best white noise machine reviews, we’ve got a fantastic budget option in the shape of the Big Red Rooster. We’ll outline below a few of the niggles fed back by customers so you can get an accurate overall picture rather than a falsely glowing review likely to have you cursing if you fall foul of the minor snags we delve into. We mention this front and center but we also have to say that, for an inexpensive white noise machine, there’s plenty the Big Red Rooster does to effectively cover up those annoying noises messing with your sleep patterns. There’s a single white noise option with the remaining 5 settings serving up natural sounds. You can choose from weather effects (rain or thunder), nature (brook and ocean) or even the comforting sounds of a summer night. While a few customers have described the ocean sound as “tinny”, this is extremely subjective. There’s an impressive volume range with the lower end almost imperceptible and the upper range louder than you’re likely to want if they are trying to sleep. This is one area where even expensive machines like the Marpac Dohm can get it wrong. If you leave the machine untouched, it will happily run all night without consuming much power. If you want it to automatically shut off – for example, if you’re using it to tempt your baby to start dreaming – hit 15, 30 or 60 minutes on the timer and relax knowing your baby’s tiny ears won’t be battered throughout the night. Since the Big Red Rooster can run on batteries not just AC power, you can use it in the car if your little ones find it tough making long journeys and you’d like to calm them down and possibly even get them to shut their eyes for a while. 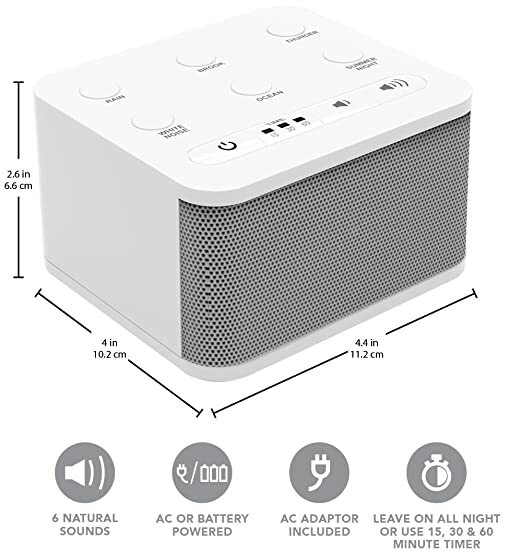 The small dimensions and lightweight nature make this equally as effective as many dedicated travel white noise machines so you can get the best of both worlds. The minimalist all-white design is broken up by a grey speaker and this white noise machine looks more like an upscale Bluetooth speaker than a device dedicated to combating noise. If you imagined white noise machines as hulking and ugly appliances, the Big Red Rooster might just change your mind. The major drawbacks of the Big Red Rooster are the looped recording which does not appeal to everyone and the fact it seems to kick out a certain level of static which can be alarming, especially if you’re buying this white noise machine with your baby in mind. There have also been a few reports of units breaking down after a few months so take into account these flaws before committing to purchase. Overall, we still recommend this device if you’re looking for an entry-level white noise machine that does a fine job of masking intrusive environmental sounds and comes in at an incredibly keen price point. It always pays to manage your expectations whenever you’re buying any cheaper product. Rarely are expensive models priced higher with no just cause and build quality is one of those areas where cheaper units obviously tend to fall down. While we’re not suggesting this is a throwaway device, it’s highly unlikely to last for years either so think carefully about your expected lifespan given the price tag. Check out the Big Red Rooster for a cheap and cheerful white noise machine ideal for all the family. 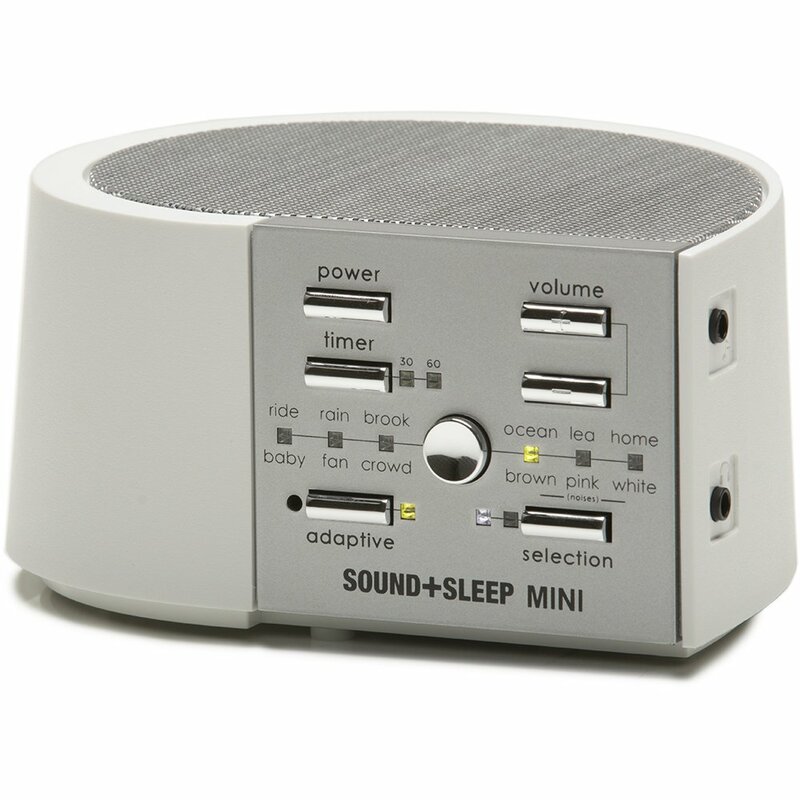 Adaptive Sound Technologies re-enters the fray with the SOUND+SLEEP Mini. The SOUND+SLEEP therapy range has several models and we opted for the cheaper Mini version since it offers all the functionality in a smaller guise making it the best all-rounder in a well-reviewed and trusted range of products. You can add in extras to each base category of sounds giving you 48 options in total. For example, with the ocean you can add the sounds of birdsong while with the brook you can throw in some frogs. This high degree of customization makes the SOUND+SLEEP a smart choice for all the family. The brown, white and pink noise categories also have 4 variants within each general frequency. If you have previously owned one of these white noise machines and found yourself frustrated trying to fine-tune the volume so you get the optimum masking effect without causing an equally offensive level of sound to replace it, the SOUND+SLEEP Mini has you covered. The Adaptive Sound assesses the environment and automatically brings the volume to the perfect level for you removing all the guesswork and fiddling around. It’s no use having all the bells and whistles in a flimsy device. Luckily, the solid build of the SOUND+SLEEP Mini means it will stay the distance rather than giving up the ghost after a couple months. You’ll get 3 choices for power with AC, USB or batteries. 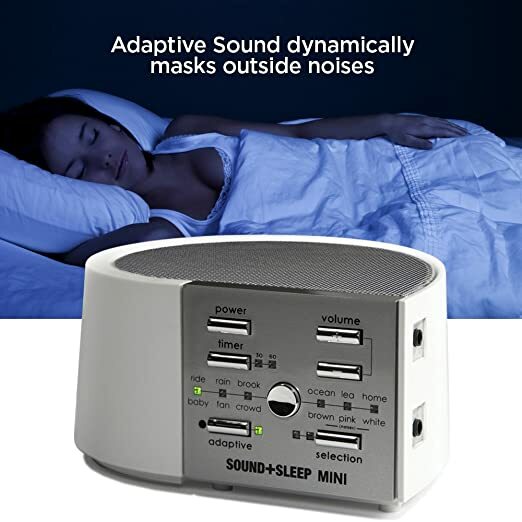 This gives you a great deal of maneuverability if you want to travel with your white noise machine and enjoy the best possible sleep even if your hotel room is in a hectic downtown area with intrusive outside noise. If you’re traveling, you can go for the model which boasts a full suite of international power adapters for a nominal extra charge. If you want to create a personal sleep sanctuary, you can easily hook up the SOUND+SLEEP Mini to your headphones for a complete haven against outside intrusion. The cable also allows you to harness the speaker to play music from your smartphone or tablet so you get plenty of mileage from a single, multi-purpose device. If you choose, you can safely run the machine throughout the night. Anyone who wants the power slashed without needing to interrupt their journey toward sleep can choose from a 30 or 60-minute auto shut-down. Since the displays on any devices like this can be garish and overstimulate you, when the timer powers down the SOUND+SLEEP Mini, the display also fades away leaving you to peaceful, uninterrupted dreams. Despite the raft of features available, operation is super-simple. The control panel is a cakewalk to navigate with the soft-touch buttons standing proud so you can feel your way for them in the dark. As with any product, not everyone is looking for the cheapest white noise machine preferring instead to focus on quality instead. If you have a slightly more fluid budget and you want a rock-solid white noise machine with a substantial range of settings, we’d strongly urge you to road test the SOUND+SLEEP Mini. Adaptive Sound Technologies are a highly respected brand in this sleep therapy space so you’ll get all the back-up you need if anything goes wrong and a product designed after a great deal of Research and Development into blocking out environmental disturbances without creating another menacing noise to replace them. The battery and USB options make this great for use on the go and its small footprint lets you pop it on any bedside cabinet with ease, right where you need it to work most effectively. Check out the SOUND+SLEEP Mini today and start improving your sleep quality tomorrow. 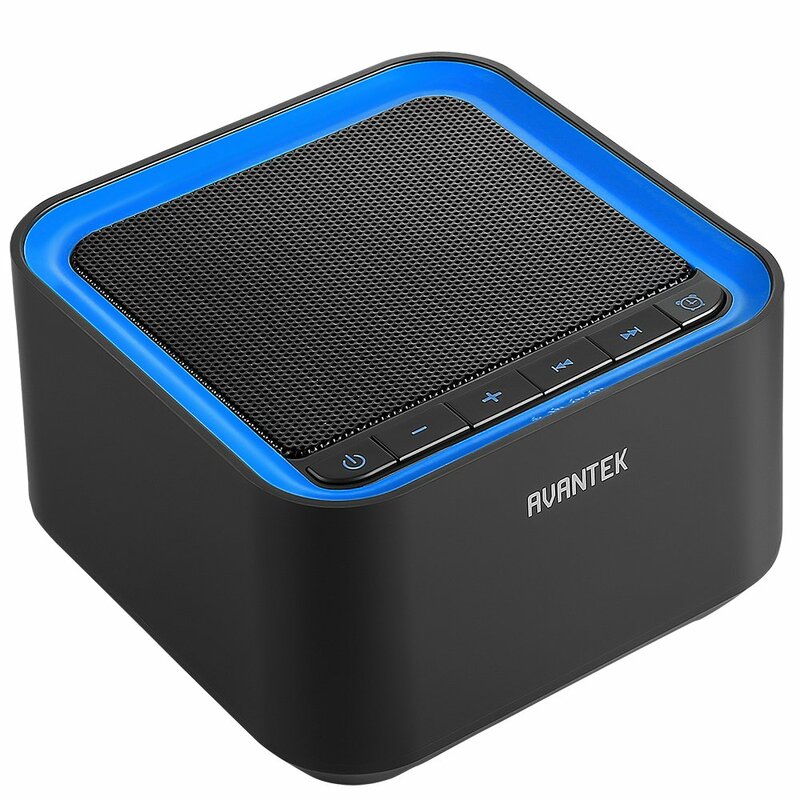 For our final white noise machine review, we’ve got a small but highly competent cube in the form of the AVANTEK, an affordable device that doesn’t stiff you on the performance front. While the SOUND+SLEEP Mini has more than double the array of sounds, the 20 varieties of noise on the AVANTEK is more than fit for purpose. You should note that these sounds are recorded rather than dynamic. This approach can often fail wildly but AVANTEK avoid much of the looping that can blight recorded units and the audio is perfectly adequate in terms of quality. One area in which the AVANTEK outflanks much of its close competition is the way in which you can choose from a staggering 30 volume settings. Anyone who has experimented with white noise machines will know it’s always a delicate balancing act. You need to get just enough oomph to blot out the offending distractions but not so much it becomes a distraction in its own right. Power is via USB cable which, at 59 inches, gives you ample room for maneuver even in a larger space. You won’t be able to rely on battery power so, if you’re looking for a car-ready model, check out one of the other white noise machines we review instead. Fumbling around to regain your old settings can be a real headache with some white noise machines. The memory function on the AVANTEK puts paid to that nonsense and, as you soon as you hit the Power button, you’ll be catapulted back to your chosen settings. This is particularly valuable since there’s no efficient way to choose the sound settings except manually cycling through them all. The memory saves you the legwork once you’ve found what you’re looking for and goes some way to mitigate this design flaw. The AVANTEK’s timer is more flexible than most. Select anything from 1 hour to 7 hours and the unit will nimbly turn itself off. As previously mentioned, this is a nice touch if you plan to use the white noise machine to coax your baby or toddler to sleep. The last thing you want is the machine bombarding them needlessly throughout the entire night. You’ll have 30 days in which to return this white noise machine if it doesn’t cut the ice so you can buy with total peace of mind. After that point, you’ll be covered against all major defects for a year and a half so you know the manufacturer stands firmly behind their product. 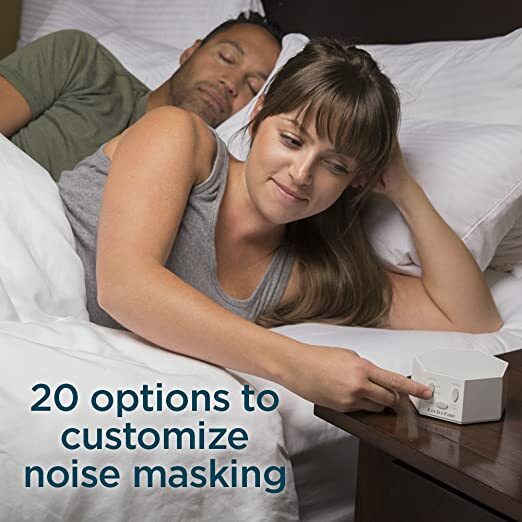 We’ll walk you through the chief advantages and minor downsides of this fine white noise machine before we switch our attention to a buying guide to further enhance your knowledge. After today, you should be absolutely confident of finding the best white noise machine for your needs without needing to spend a fortune or waste too much time sifting through options. If you want a white noise machine that comes in at a keen price point while still delivering plenty of power and range, the AVANTEK is well worth popping on your shortlist. For a machine that uses recorded sounds, the AVANTEK is a nice surprise. With a couple of minor glitches aside, the audio is an almost loop-free experience with a respectable range of sounds meaning there should be something for everyone in the family. 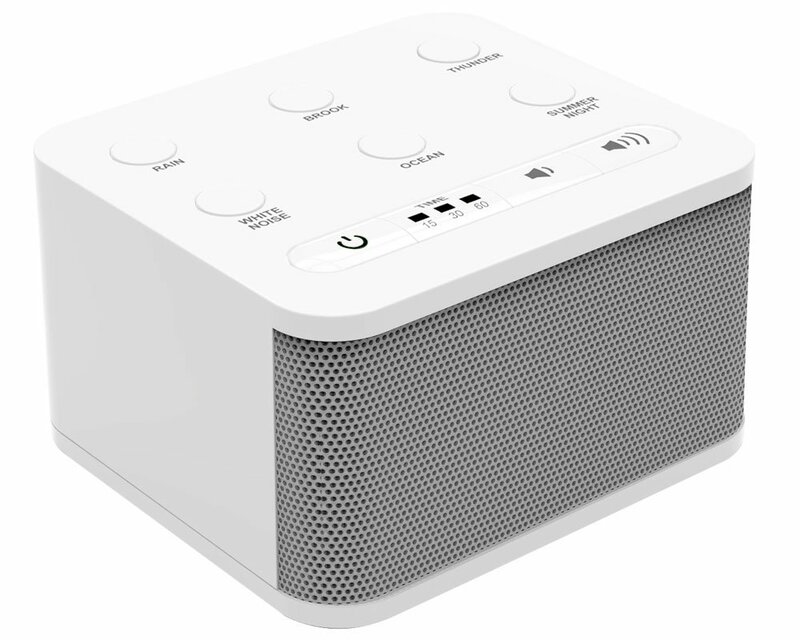 If you’re on the hunt for a small and very lightweight white noise machine that’s at home in the bedroom but will also serve a turn as a travel device, we’d seriously suggest the AVANTEK as a pocket-friendly white noise machine that packs a considerable punch. Now we’ve given you a tour of 5 of the best white noise machines to help ease you toward a sounder slumber, we’ll take a look at why this equipment can be so effective. 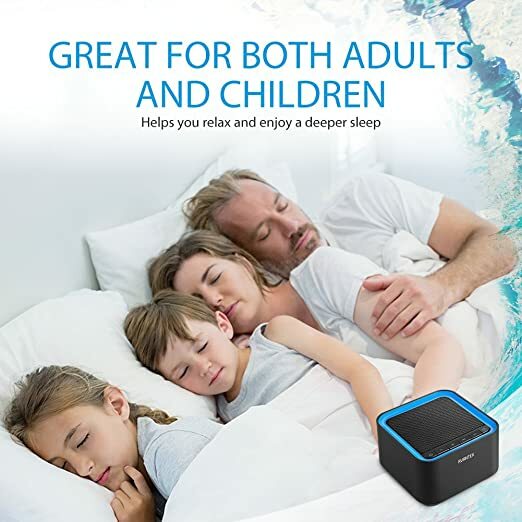 We’ll also show you what to consider when you’re looking for the best white noise machine so, in tandem with our reviews, you can secure the optimum sleep aid. White noise is a consistent sound you can hear across all frequencies. It’s named for white light in what turned out to be a false analogy since white light was once incorrectly thought to have a flat power spectrum across the board. The principle of using these random signals to help with sleeping and focus has been harnessed by many manufacturers in response to the needs of customers. Tinnitus sufferers can find particular relief from their symptoms by making use of these machines. White noise itself is actually pretty harsh so many of these so-called white noise machines kick out a variation that’s less scratchy and invasive. Whether it’s pink noise or other colors of noise, it’s increasingly common these days to have a white noise generator capable of kicking out a broad range of soothing sounds from waterfalls to waves, rain to soft music and various sub-categories of noise loosely related to white noise. With so many distractions all around us, whether it’s sirens and traffic in the city or dogs and livestock in the countryside, making sure you get your recommended 8 hours of sleep can seem like more effort than working for 8 hours. While it might seem a strange concept to add more noise if you want to sleep soundly, the principle is sound. You are generally woken in the night not by a given noise – a barking dog, say – but by the change and inconsistency in overall noise levels. Think of white noise and its associated categories of background sound, then, as a kind of masking effect flattening everything out to the same frequency. We are not claiming that this type of noise works for everyone. It doesn’t. You might find that you’re more disturbed rather than relaxed so you really need to try this type of approach out. A good idea is to check out some YouTube videos first like these white noise for sleeping soundtracks. Leaving your phone or laptop on all night is not always practical, though, which is where white noise machines come into their own. Could You Benefit From a White Noise Machine? Bottom line, if your sleeping environment is in any way preventing you from getting the rest you sorely need, it’s worth at least thinking about a white noise machine to fight back. 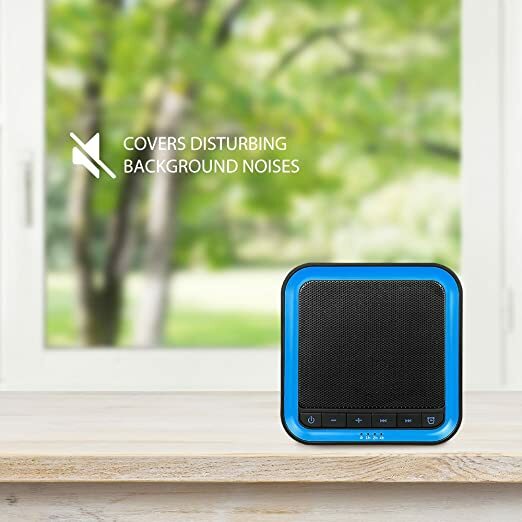 Is Your Sleeping Environment Noisy and You Need To Block Out Intruding Sounds? If you’re unlucky enough to live somewhere that seems to be perpetually noisy, a machine delivering constant and random white noise is your wisest bet. Not only is this type of machine more effective at blocking out sounds, it will also be far less likely to disturb you in its own right, an inbuilt flaw with some machines. Has Your Sleeping Quality Suddenly Deteriorated? If you find that your sleep quality has taken a sudden dip, examine first whether it’s really environmental noise issues or an underlying problem preventing you from getting the sleep you deserve. For anyone who once slept easily but now struggles, a sleep machine with a range of comforting, pre-recorded sounds can work well. Whether it’s waves lapping against a shore, the muted noise of raindrops in a forest or various carefully selected nature sounds, this type of machine can promote overall relaxation leading to a superior sleep. With many home and garden products, there’s a serious list of features and factors you need to think about before buying. Luckily, white noise machines are pretty simple and all you need is a few pointers and you can easily choose the best unit for your needs without needing to do much homework. Once you’ve determined whether or not this approach to sleeping better might work for you, what should you look for in the best white noise machine? If you’re a light sleeper hankering after a helping hand to reach dreamland, hopefully today’s white noise machine reviews have given you confidence that such help is within easy reach. Think about the sort of sounds that most soothe you and get yourself some machinery capable of generating this so you can embrace a fuller and more satisfying sleep even under challenging conditions. Drop us a line if you have any questions or feedback at any stage. We’re aiming to make this site a one-stop shop for everything related to your home and garden so let us know if there’s anything you’d like us to cover.